I have something special for you today! A gorgeous shade of nail polish, from a local brand named Farmec, their headquarters are right here in my city so yeah... I'm being supportive of local bussinesses. Although it's a local brand they are present internationally, here's where you can find out if they're available in your country (Farmec-Distribution). This particular one is included in Farmec's A/W 2013 Collection and it's called Silent Night. 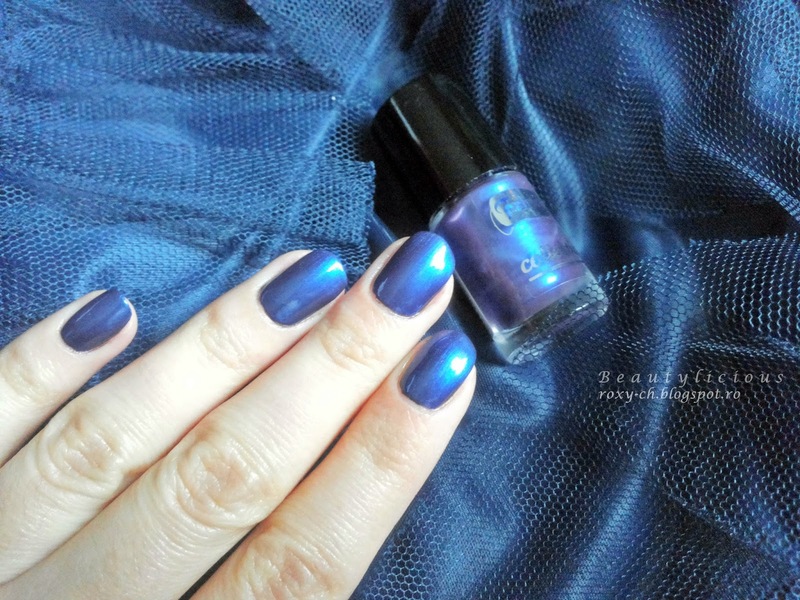 It's a deep blue with metalic irizations and purple highlights, so depending on the light, you have blue nails or a combination of blue'ish purple nails. It definetly is a chameleonic shade - that's why it's so special. Wearing it, your nails will have an elegant and sophisticated look; just perfect for the upcoming holidays, right? Unfortunately, it's not very pigmented from one coat so you'll need from two to three coats to make it opaque, or you can apply a layer of black nail polish and then one or two of this beauty. The result is worth the trouble! If you choose to go with the black undies you should be done in 10 to 15 mins but if you go with the first version be careful at the drying time. Given that it has metalic irizations, there may appear some streaks, but because it's a darker shade they are visible just from up close (you could apply a top coat for that). I went with the black undies, two thin coats of Silent Night and no top coat, as you can see it has a nice shine to it. Of course, the gloomy weather wasn't really helpful with the photos, sorry! The shade is quite spectacular in real life. Let me know what you think! Wouldn't it be perfect for a glamorous New Year's Party? *This product was provided for an honest, unbiased review. All the opinions shared in this post are my own. Si mie imi place lacul asta. E o nuanta frumoasa!